A White Honda Civic led the funeral cortege of 14-year-old Jamie Doherty. The Donegal schoolboy died last Friday evening when the black Renault Clio he was driving crashed near his grandparents home in a remote part of the Inishowen peninsula. Students from Moville Community College - where Jamie had just finished second year - formed a guard of honour as Jamie’s remains were carried to and from St Columba’s Church in Ballinacrea, outside the town of Moville. Jamie died instantly when the car he was driving spun out of control and crashed on a side road at Tullyally, Upper Clar, Redcastle. He had driven the short distance from his home when the tragic accident happened just before 6pm. His mum, Evelyn, spoke at the end of the Funeral Mass about the ’14 special years’ the family had with their son who was ‘too special for this world’. 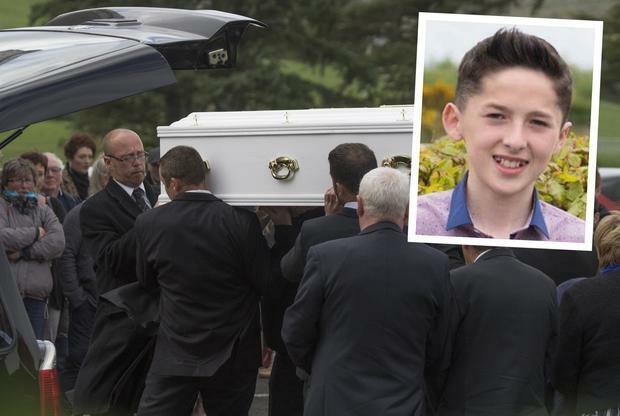 Jamie ‘doted on’ his younger brothers, Davin and Shay and grief-stricken parents, Evelyn and Shane, were among the pallbearers, carrying Jamie’s white coffin. Only the howls of Storm Hector and the haunting bell of St Columba’s Church punctuated the sombre, silent air. “Jamie was so very well liked by the community, by his school and by his class,” said Fr Tony Mailey, who celebrated the Funeral Mass. Fr Mailey said: “An accident like this has really brought people together. “We have seen peoples’ true colours with the kindness and attention they have given the family. Jamie’s family will get that, too, in the days, weeks and months ahead.